Christians have been urging retail outlets to put "Christ back in Christmas" and to "Remember the Reason for the Season." Now you can step back in rejoice in our success!! 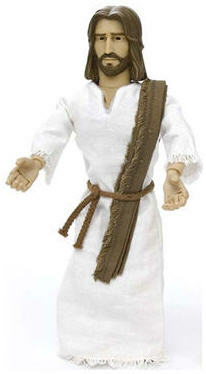 The company who makes talking Jesus is one2believe which promotes Bible Based Toys for Children. The company has a marketing campaign called "Battle for the Toy Box" through which they are promoting their faith-based toys to the faith community. To me this kind of goes against the Second Commandment of not making "an idol or an image of anything in the heavens." I know we have taken great liberty throughout the years with that verse, so I guess we should be excited that these products sold so well in a "secular" market, since "Faith-based dolls are nothing new in Christian stores" according to an article in the Des Moines Register. wierd... I wonder what talking Jesus says! I love you Nick! Wow, I'm not sure what to think. My hand was over my mouth when I read about "talking Jesus", so I think I'm put off. I want to teach my kids about Jesus, but I think this might be irreverent.